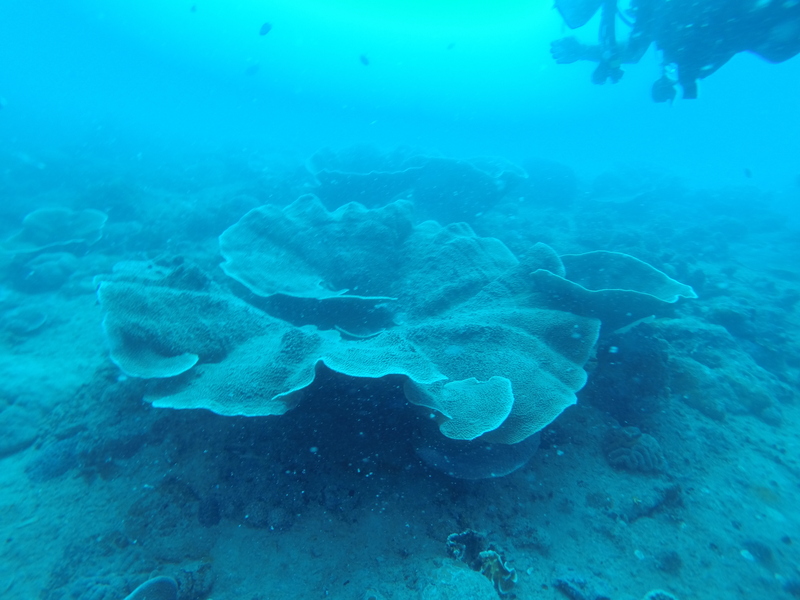 scuba diving: coron shipwrecks | loveliness. This post is part love affair, part horror story, but that’s ok because it has a happy ending. While we were in the Philippines we decided to make the trip to Coron because we’d heard over and over again how amazing the diving is there, because there are several sunken ships to dive, a remnant of the Japanese fleet from WWII. We’d done one shipwreck dive in Bali, and loved it so much, that we were completely stoked to do it again. If you’ve been to the Philippines, you probably know already that things tend to work a little differently here than in other places. I’ve been diving quite a bit, in many different countries, and the safety standards are usually pretty much the same but after arriving in Coron, we realized that most of the shipwreck dives are supposed to be for advanced divers only. We thought we wouldn’t be able to dive them, but after visiting 4 different dive shops, all of them told us basically the same thing, that even though most of the wrecks were over 30M deep, and we’re technically only certified to dive to 18M, and we aren’t certified for wreck diving, that it wasn’t a problem, and that in the Philippines “we don’t have to follow the rules”. Now, let me stop and say that obviously, in the end it was my choice to go. Nobody forced me, and even thought I felt kind of uncomfortable, I wanted to try it so I went anyway. We were supposed to dive 3 wrecks, the Tangat, the Olympia, and the East Tangat. 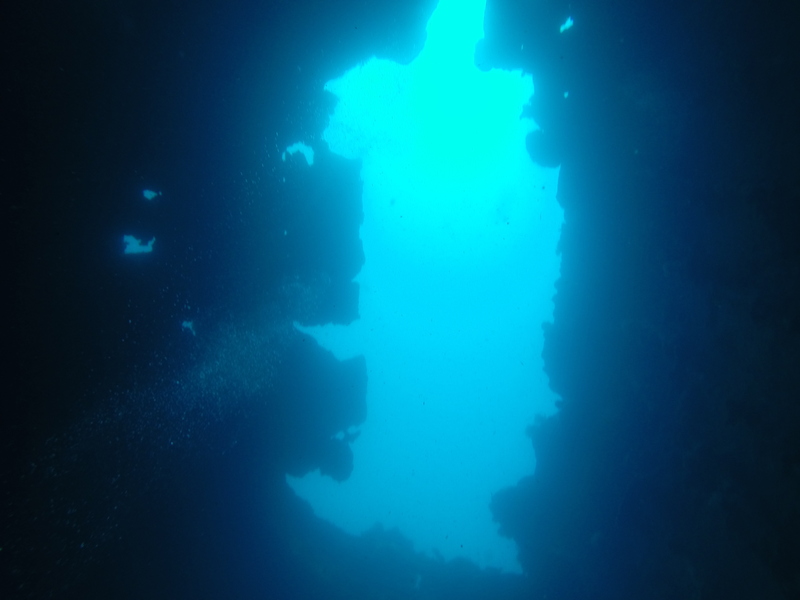 The Tangat was the first wreck, and it was also the deepest. 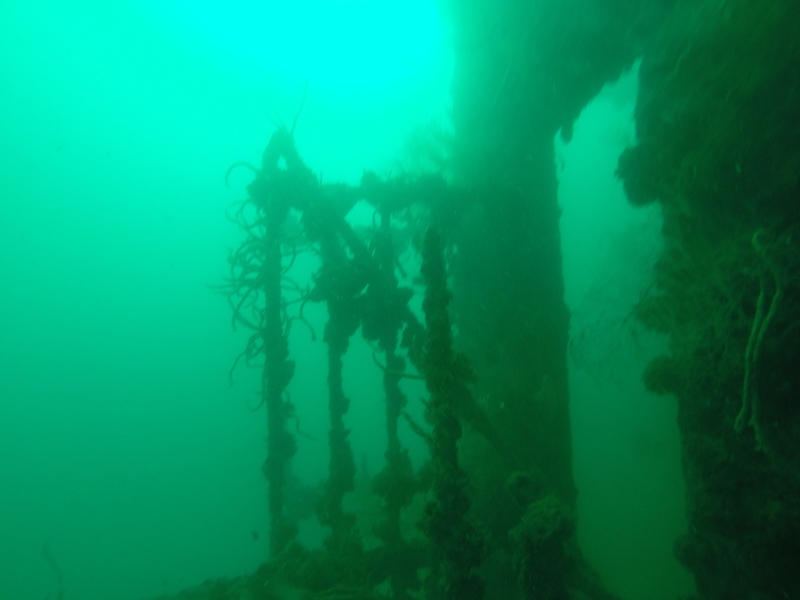 Everything went smoothly for the first half of the dive, the wreck was amazing, and there was so much to see. I have to admit at this point that I am a bit claustrophobic, but it’s never been a problem for me before when I was diving. 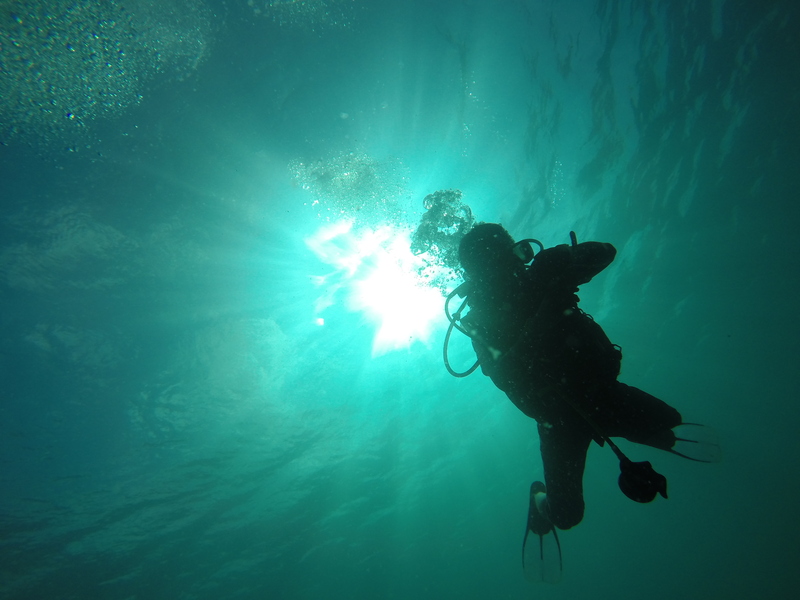 As long as I can keep moving in any direction at a constant pace, I never feel too boxed in (for me, as true as in life as it is in diving). 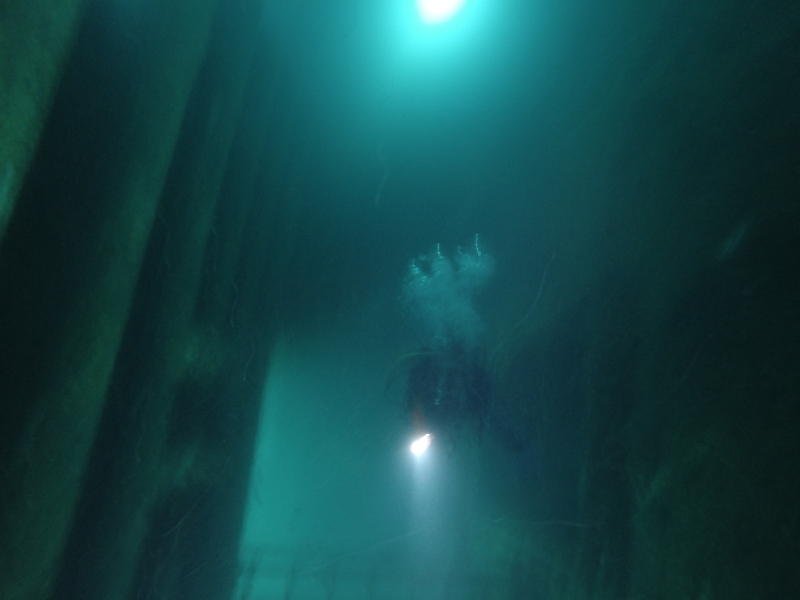 This dive was different than any I’d done before because the water was very murky, and because we were down so far, and also so deep inside the ship, it was pretty dark, and we need to bring a flashlight with us to see anything. 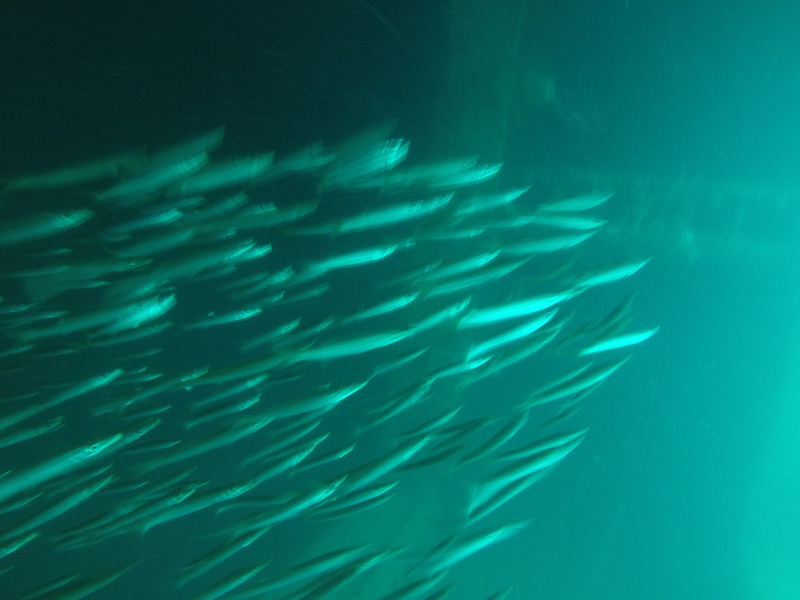 We were inside the ship, and our guide was moving very slowly, basically stopped, to play with some clams and other little fishes on the bottom of the deck we were swimming on. I started looking around, and saw our bubbles coming out of our mouths, up to the opening of the deck above, and when it hit the opening, there was an effect like a shimmering mirror, and it looked really neat. But as soon as I saw it, my stomach flipped, and I started feeling like a heavy weight was on my chest. I could feel myself starting to panic, but I tried to keep calm and kept breathing as normally as I could. 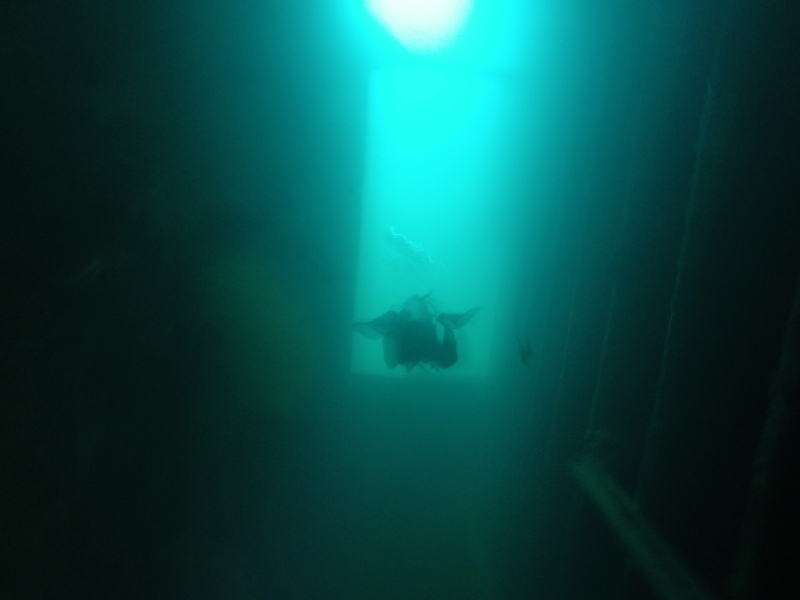 Right then, our guide indicated to us that we were going to be going down another opening into the deck below, and I knew I shouldn’t do it, and indicated that I needed to surface. 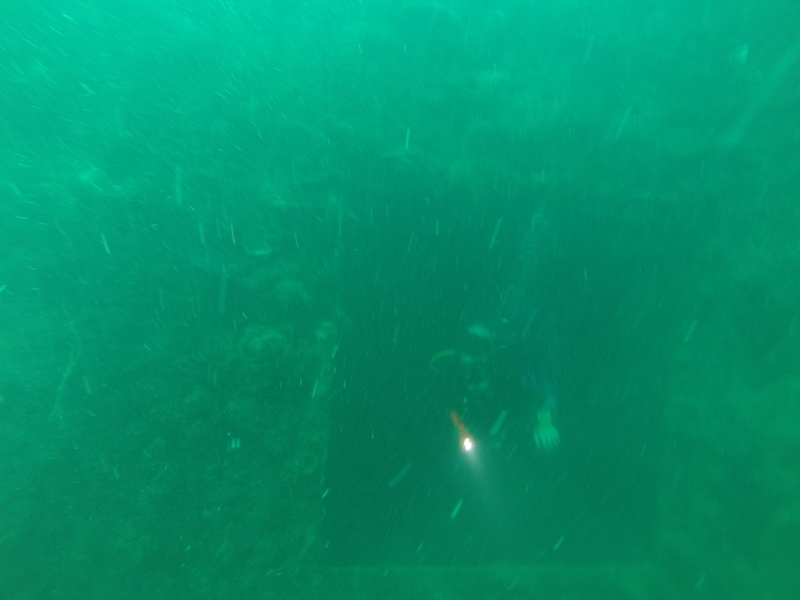 We were down at least 35M, and at that depth you have to take your time to go up, and take decompression stops so your body can get rid of the excess nitrogen from breathing compressed air under the pressure of that much water. Our guide was totally great about it, and started getting us out of the ship and back up slowly to the surface. I felt better as soon as we were out of the wreck, even though we were still down pretty deep, but thought I better go up anyway. I went up and hung out on the boat for a bit, while the rest of the group (there were only 3 of us) went back down and finished the dive. 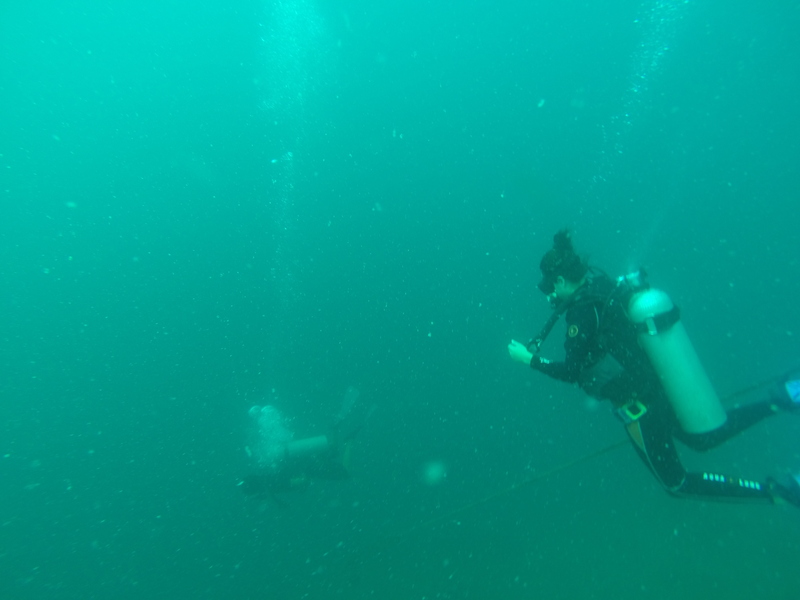 After lunch and a surface interval, it was time to do the second dive. I wasn’t sure if I should do it, but I talked to the guide, and we made an alternate plan for if I was feeling uncomfortable going into the wreck. We started descending to the Olympia, and I was feeling good about it, but the visibility was really bad, and as soon as we got to the entrance to the first deck of the ship, I started feeling claustrophobic again, and had to come up almost immediately. The second time was actually worse than the first time, we were down about 30M, and I really started to panic. I couldn’t breathe, I was hyperventilating and crying into my mask. I had to force myself to stay where I was and keep breathing normally, even though a big part of me just wanted to go up as fast as possible. The 3 minute safety stop was probably the longest 3 minutes of my life. Needless to say, I skipped the third dive. In a way I’m kind of glad it happened, just because I always wondered how I would react in an emergency situation as a diver, and I think I handled it pretty well. If I hadn’t been able to keep calm and force myself to follow the procedure, it could have been really bad. It also gave me a brand new respect for people who suffer from anxiety and panic attacks, because that was definitely not fun. So the moral of that story is, I’m probably never going to be a wreck diver, and enclosed spaces and I will never be friends. But if you are in Coron, and you are certified, definitely make it a point to dive some of the wrecks, because I was down there long enough to see how amazing they were. Felt the same way when diving in Coron. I’ve always loved the water and diving was all kinds of happy when I get to see all those fishes and reefs, but I don’t know. 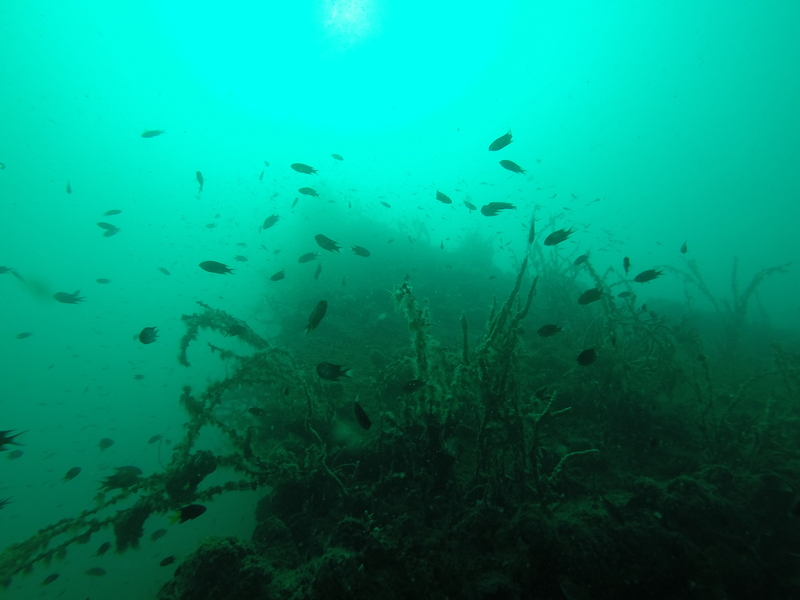 I felt so constrained when we went to see the shipwrecks, and I couldn’t even go deep. Still admire you though, for trying again with the Olympia. That’s exactly how I felt Louise, I was worried I wouldn’t be able to dive again after that, because I’d never experienced anything like that, but I just went wreck diving in Hawaii a few days ago, and it was scary but I did it! Pingback: diving yo-257: hawaii | loveliness. Pingback: seattle: everything else | loveliness.